December has arrived. The evening air is bitter cold and heavy with the smell of wood smoke. Someone on your street will have got OTT with inflatable snowmen and bright, ornamental reindeer on their lawn. Your kids will have nightmares about them. So will you. The TV flickers between adverts; dolls, dogs, makeup and monsters. Hundreds of brightly coloured adverts fill the screen. After each one my son bellows, ‘I want that one for Christmas please mummy!’ He doesn’t want them…not really, but Christmas for him is about gifts. About wants. More. Being five years old you can understand this. Somewhere, Santa and everything he stands for, is crying. When toys are advertised on TV or in stores and our child expresses interest, we tell them they should put it on their Christmas list. That if they are good they might get it. 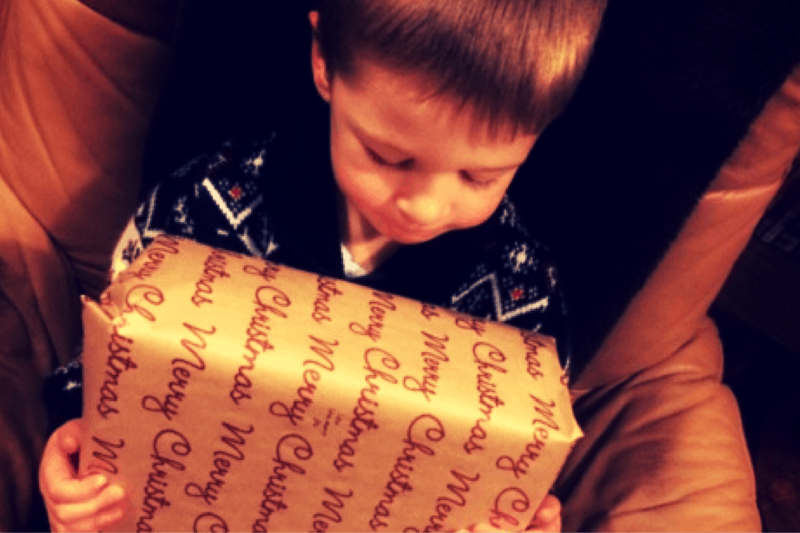 To me, it’s not what I want my son growing up thinking the holidays should solely be about. They are about family, being grateful, togetherness, magic, terrible music and failing to make mince pies. Being thankful and giving to others. We spend the time to make our own cards. Little boy writes them. They are made with PVA, buttons, patience and love. Shoeboxes are sent full of toys to other children and pictures of my grandparents are shown and fond memories of Christmas past shared. For months I have been giving Leo a pound a week that he has kept in his till to save and use for someone who needs it. Generosity, compassion. These are gifts that I give to my son that will outlast any Furby, Barbie or action hero. It’s for this reason we’ve teamed up with Oxfam who have created 4 ‘Stories of Hope’ to show what donations can do for the lives of people all over the world. They remind me that small actions can make a difference. £2.50 can provide 25 water treatment sachets to a family in an emergency. This is enough to make around 500 litres of water safe; enough to last a family of four for a month. As parents we know the importance of family. Kitabe grew up working on a maize farm with her family in Ethiopia. She didn’t have high hopes for her future after leaving school in the first grade finding herself forced into an arranged marriage. Kitabe joined Oxfam’s project and took out a loan of 10,000 Birr – the equivalent of £324. As a result, she was able to buy more seed to grow crops. After the first harvest, Kitabe was able to pay it back and even had enough to buy more land. She has also purchased a cow and an ox, providing her with an extra source of income which is used to pay for additional labourers on the farm and is given support as a working mother. Reading my son stories like this teach him about the world and show him what sharing can bring to people. If you can please donate online to Oxfam and join them in their fight against poverty. Thank you for reading and happy giving!